Ahhhh - Bobbin Busting - it feels so good!!! You know how good you feel when you whittle away the excess accumulation of coins from your wallet - - - well it can feel that rewarding to pare down your bobbin collection. All the machine quilting I've been doing lately has given me the perfect opportunity to use up those almost empty bobbins I've been neglecting . 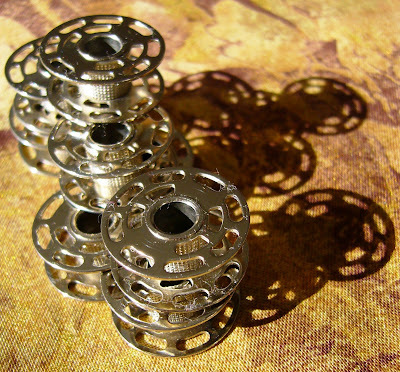 Look at these five bobbins in my collection, each containing a little more than a smitch of thread - too much thread to discard, but just enough to expel them from the machine when you're turbo quilting and don't want to run out of bobbin thread mid-motif. 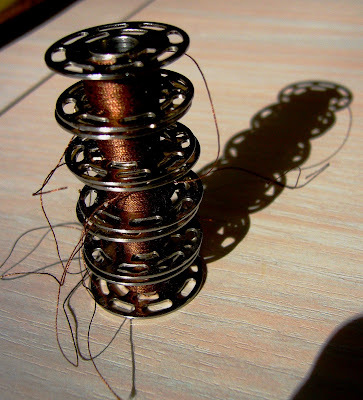 But five brown, almost empty, bobbins - what was I thinking??? 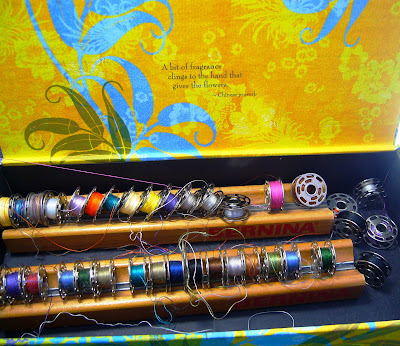 I keep all of my bobbins in this cute little box - upcycled from it's original use as stationary packaging. 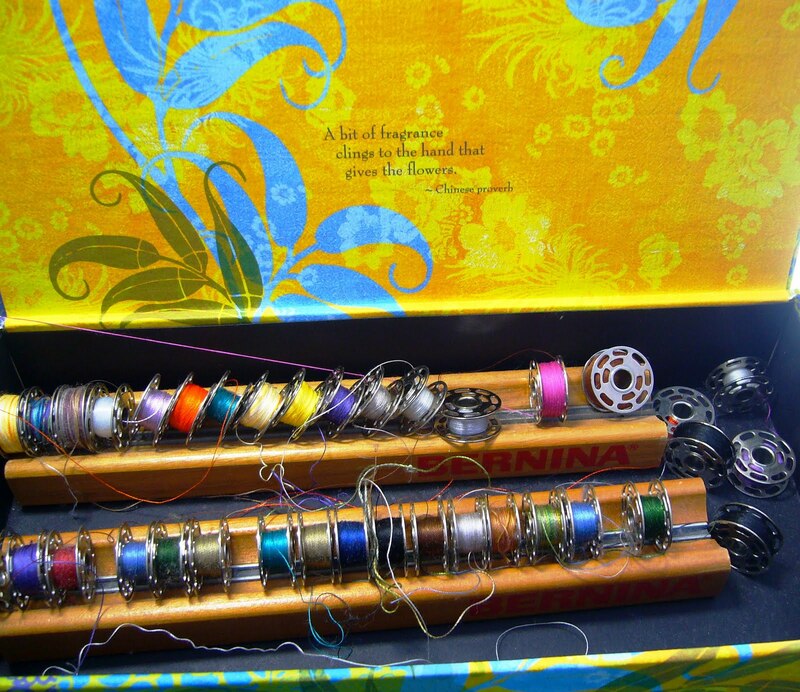 Look at the collection of mis-matched bobbins - - - it's time for a spring cleaning - - - that being said, it's time for spring, period! It was a successful bobbin busting day - - - look at all of the bobbins I set free - - - and this doesn't include the five brown bobbins above which today stand empty and ready to receive their next assignment. Quick Reminder for Local Readers: Tonight is the opening of the quilt show at Jenkins Arboretum in Wayne, PA - Celebrating Nature's Beauty in Stitches. I had the opportunity to juror this show - first time ever as a juror, an interesting experience. 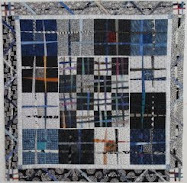 The show includes works from 3 feature quilt artists and numerous works from other local quilt artists as well. Word of advise - parking is quite limited at the arboretum! The show runs through February 28th, and the arboretum is open daily 9AM - 4 PM. There is a lovely show catalog available for a $5 donation, otherwise, the show is free to all.